This article describes how to configure OneLogin to provision users to Egnyte. Go to Apps > Company Apps and select the Egnyte app you want to enable for provisioning. On the Configuration tab, click Authenticate and follow the prompts to connect to the Egnyte API. Note. You should already have entered your organization's Egnyte subdomain in the Egnyte domain field when you configured SSO. If you haven't, you must enter it now and click Save before you click Authenticate. Click Enable provisioning for Egnyte. For any action you select, a OneLogin administrator must go to Users > Provisioning and manually approve each action for provisioning to complete. Clear these options if you want OneLogin to provision new users and user updates to Egnyte without administrative approval. Select what happens to a user in Egnyte when that user is deleted from OneLogin. Click Refresh to populate the Groups and Roles attributes on the Parameters tab with your Egnyte account's existing Group and Role values. You can use these values later in the configuration process to create rules that assign specific sets of OneLogin users to defined Egnyte Groups and Roles. 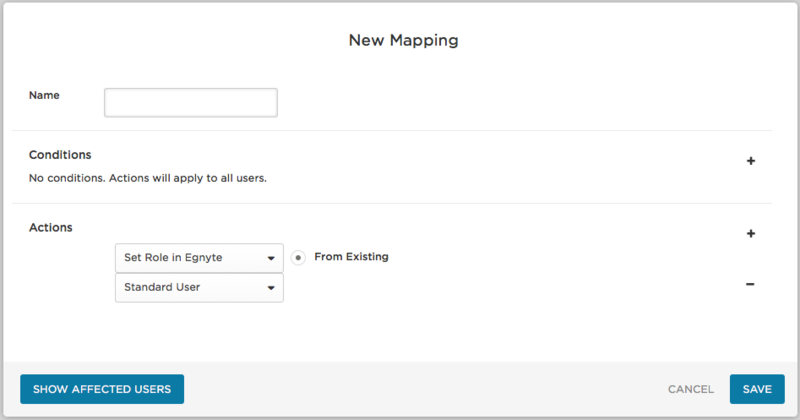 In this task, you'll map Egnyte user attributes to OneLogin user attributes. These mappings tell OneLogin how to populate user attribute values to Egnyte when provisioning users from OneLogin. If you have a OneLogin attribute value that you want to send over to populate a Egnyte field, you'll define it in this task. Go to Apps > Company Apps and select the Egnyte app to which you want to provision users. Attribute-specific details are listed in the table below. Use the Groups parameter to provision a user as a member of an Egnyte group. You can provision users to existing Egnyte groups, or you can create rules to create new groups in Egnyte when you provision users. For more information, see Using Rules to Provision Users to Egnyte Roles and Groups. To have your existing Egnyte groups display as available values when you configure provisioning, you must first refresh entitlements. To do this, in your Egnyte app, go to the Provisioning tab and click Refresh. If you want to provision all of your users to one or more existing Egnyte groups, configure provisioning using the Groups parameter alone. To do this, move the Egnyte groups to which you want to provision users from the Available values column to the Selected values column. This configuration will provision all of your users to each of the selected Groups. If you want to provision subsets of your users to one or more existing or new Egnyte groups, configure provisioning using the Groups parameter and rules. See Using Rules to Provision Users to Egnyte Roles and Groups. If you want to manually provision users to groups based on Group values that you'll set in Egnyte user logins, leave Value set to - No value -. In the Default if no value selected drop-down, select - No default -. 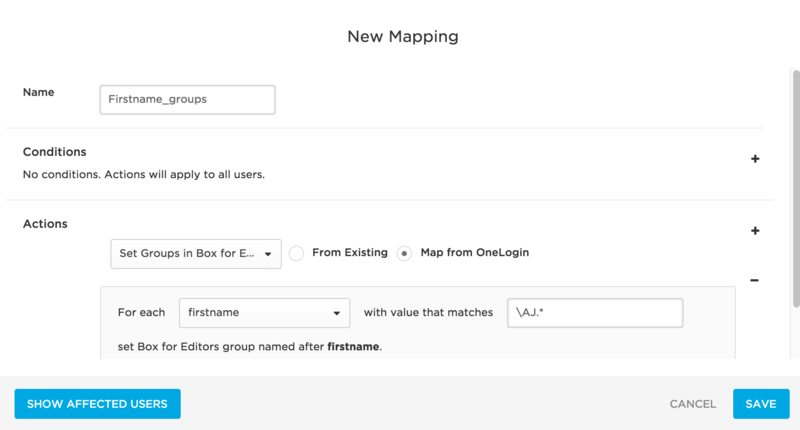 In Egnyte, manually create groups based on the Group values you've set in the Egnyte user logins. Groups provisioning uses Safe Entitlements, a OneLogin feature that prevents provisioning from deleting users that were added directly via Egnyte. For more information, see Safe Entitlements. Use the Role parameter to provision a user with an Egnyte role. To populate the Egnyte roles available for selection, you must first refresh entitlements by clicking Refresh on the Provisioning tab. We recommend that you set the Role value to Standard User and use provisioning Rules to assign specific sets of OneLogin users to the Administrator or Power User roles. 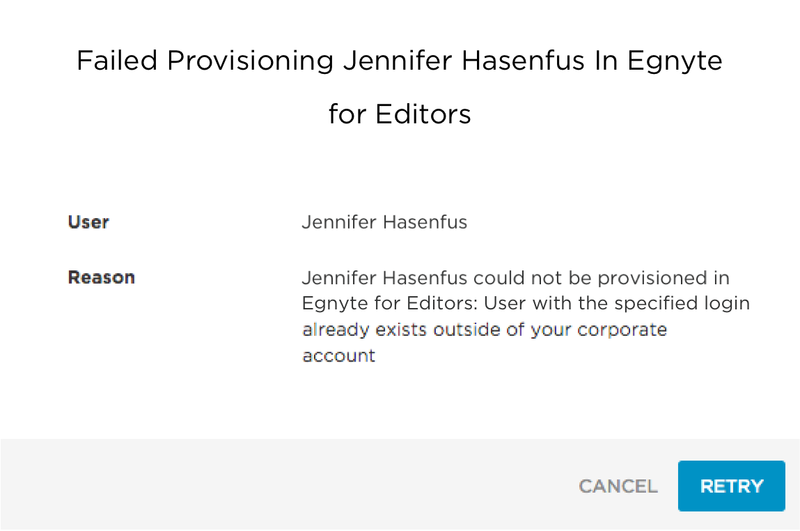 See Provision Users with Specific Titles to an Existing Egnyte Role for an example. You can define rules to provision subsets of your OneLogin users into Egnyte roles and groups. For example, you can define a subset of users by filtering on a specific OneLogin user attribute value and then define an action that provisions the subset of users to a specific Egnyte role or group. Go to Apps > Company Apps. Search for and select your Egnyte app. 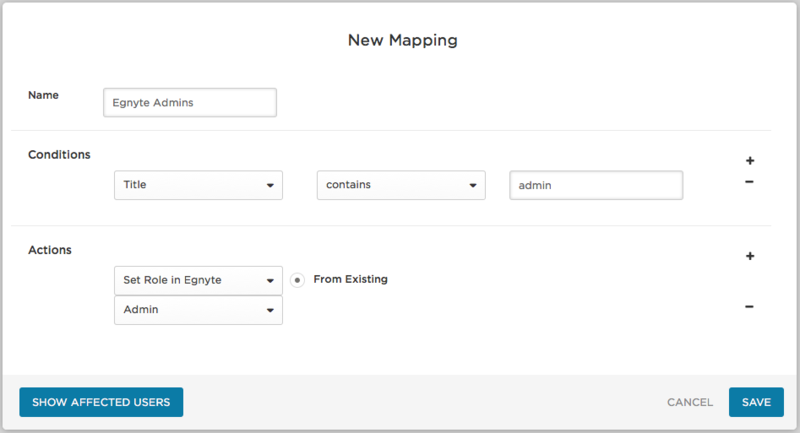 Click New rule to open the New Mapping dialog, where you can set the conditions and actions that determine which users will be provisioned from from OneLogin to specific Egnyte roles or groups. For use cases like this one in which you are provisioning users to new Egnyte groups, no conditions need to be set. All settings are configured in the Actions area. In the first drop-down, select Set Groups in Egnyte App Name to provision OneLogin users to groups in Egnyte. Select the Map from OneLogin option to provision users to new Egnyte group created based on information in OneLogin. Select a For each value of memberOf to provision users to Egnyte based on their member_of user attribute value. To identify the AD/LDAP security groups that will be used to create groups in Egnyte and provision users to them, provide a regular expression (regex) in the adjacent field. Provisioning will parse through AD/LDAP security group data and apply the regex. For each matching value, a group will be created in Egnyte. Any users who are members of a matching AD/LDAP security group in OneLogin will be provisioned to the newly created group in Egnyte. Use the two adjacent fields to write a condition to select the AD/LDAP security groups that contain the users that you want to provision to Egnyte. In the first drop-down, select Set Groups in Egnyte App Name to provision users in the selected AD/LDAP security groups. Select the From Existing option to provision users to an existing Egnyte group. Select the existing Egnyte group to which you want to provision the users who are members of the selected AD/LDAP security group. In the first drop-down, select Title to provision users with a specific OneLogin title user attribute value. Use the two adjacent fields to write a condition to select the titles that you want to use to provision users with an existing Egnyte role. In the first drop-down, select Set Role in Egnyte App Name to provision users with the selected titles to an existing Egnyte role. The From Existing option to provision users to an existing Egnyte role is selected by default. In the adjacent drop-down, select the existing Egnyte role, Standard User, Power User, or Admin, to which you want to provision users who have the selected titles. A common scenario for this use case is one in which you have set up the Role parameter to provision all users to the Standard User role as described in Mapping Egnyte Attributes to OneLogin Attributes. You can then configure a rule like the one described here to provision a subset of users with the Admin role. For this subset of users, this Admin role provisioning will override the Standard User role provisioned by the Role parameter. Test your provisioning setup to confirm that provisioning from OneLogin to Egnyte is working. Create a test role and add your Egnyte app to it. Access the test role that you just created. Click Save. This will trigger provisioning of the test user to your Egnyte app. Go to Users > Provisioning to approve the provisioning action. Click the row and click Ignore or Approve, depending on your test case. If the provisioning row shows up as Failed on the Provisioning page, click the row to view a reason for the failure. Click Retry to try again. When the user has been successfully provisioned according to OneLogin, go to Egnyte and confirm that the new user has been added.